Part drawing activity part puzzle, with their simple outlines our farm animal complete the picture puzzles are a good way to test childrens observation and pencil control. The beak, neck and part of the body are missing on one of our chickens. Can you use the picture on the right to help complete the chicken? Can you complete the goose by drawing in her neck and tail? Take care to copy the picture. Test your drawing skills by filling in the missing areas on our complete the ox puzzle. Don't forget the tail! 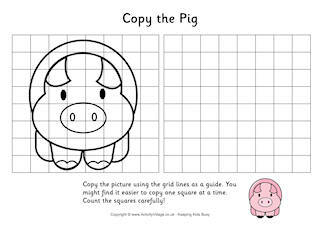 The bold simple lines of our pig image make our complete the pig puzzle a goot introduction to our complete the picture puzzles.